The ASEAN Human Rights Declaration (AHRD) is a document that is going to be very important to all of us in ASEAN, Singapore included. The ASEAN Intergovernmental Commission on Human Rights (AICHR) has been working at this document with their team of experts for almost a year. Come this November, the document will be handed over to the 10 Heads of State in ASEAN for it to be formally accepted as a document that governs how ASEAN will observe human rights. At a recent consultation with civil society organisations (CSOs), there were many useful pointers that were raised by various CSOs on the document that we think is also need to ensure they remain, appear as part of the document. These discussions took place without us seeing the document. This month the AICHR team will hand over the draft AHRD to the Foreign Ministers in the respective countries. MARUAH has been holding consultations on AHRD from last year. This will be our 3rd discussion. We have also made 2 formal submissions to the AICHR team for consideration. Many CSOs have also made their submissions. The purpose of this consultation is to provide an update, discuss what we consider as some non-negotiables and to submit the discussion to the government. As there are many submissions this consultation will focus on key elements that we we as essential to being in the AHRD. It is a reiterative process. MARUAH has been also asking for a CSO meeting with the AICHR representative for Singapore, Mr Richard Magnus. There is no indication when this will happen, but in the not too distant future. 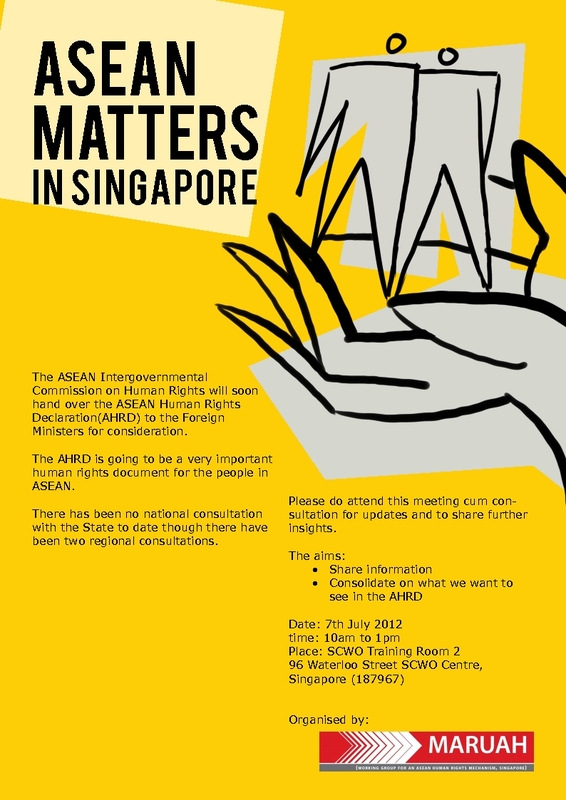 So if you have been following the developments in ASEAN and human rights, please do come to this consultation. This entry was posted on Tuesday, July 3rd, 2012 at 9:23 am and is filed under ASEAN, Events. You can follow any responses to this entry through the RSS 2.0 feed. You can leave a response, or trackback from your own site.